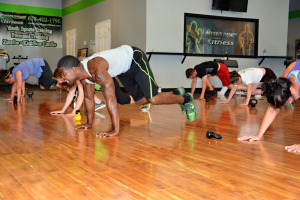 Get into great shape & Revolutionize your body with Hybrid Kickbox Cardio! This class combines elements of low impact shadow kickboxing, with energetic music for an awesome cardio workout! This class not only shapes and tones your total body but it also improves balance, flexibility and core strength. Arms are toned, legs are shaped, and cardio endurance is raised through the roof in this action packed class. Burn a ton of calories with easy-to- follow combinations of punches, kicks and steps. 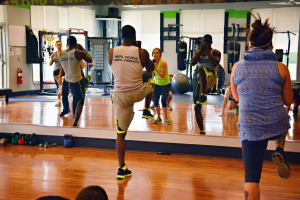 There are modifications for every fitness move taught in the class, which allows participants at different fitness levels to still get a great workout. No boxing gloves or heavy bag is required for this class. Hybrid BootCamp is a total body class where participants will be broken into small group as they exercise and every exercise will require teamwork. This is a great class as it builds cohesion and teamwork while keeping the competitive juices flowing in an encouraging environment. We bring in all tools needed for the class such as small hurdles, agility ladders, battle ropes, resistance bands, med balls and much more. This popular high-energy class always works well with groups as it causes people to go beyond the norm in a group setting. Participants can expect to burn up to 1,000 calories while working every muscle in the body in this total body class. This can also be modified for smaller groups as well. This class is for people of all fitness levels so that participants of all fitness ranges can participate in a safe environment. In our Kettle bell Impact class it features up-tempo high-energy music using small iron cast weights. 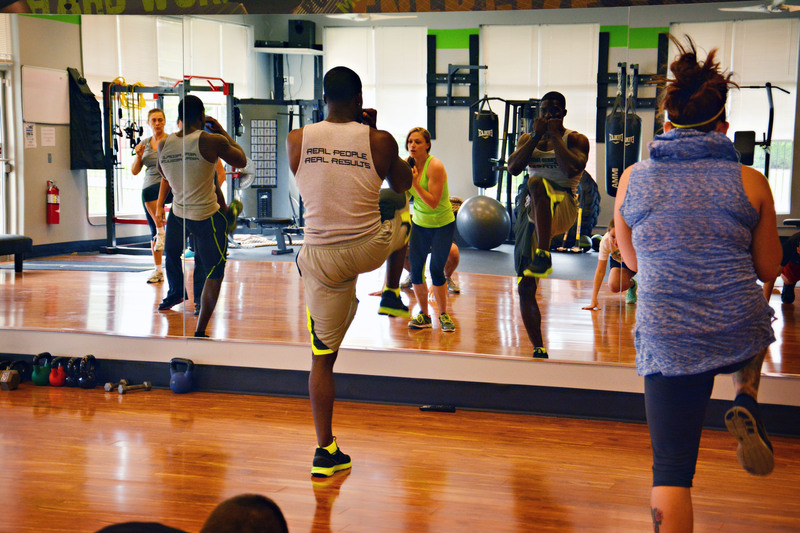 Every movement in this class delivers cardio, core and resistance training all at the same time. As you tone and sculpt your muscles, you’re replacing fat with lean muscle. The amazing benefit is muscle burns more calories and fat, so you lose weight faster – while adding definition. This total body workout attacks every part of the body from the core, lower back, arms, shoulder, chest, back, thighs, and glutes every class. For all of these reason Kettlebells has been around for centuries remaining one of the most popular and effective tools for transforming the human body. Modifications are used for all participants that may have any physical limitations so anyone can take this class in a safe and effective manner. This unique class is a guaranteed to tone, flatten and strengthen your abdominal core, oblique and lower back like nothing else. Our approach of using the latest techniques and devices such as the ab sliders, stability balls, medicine balls and bodyweight exercises gives participants an instant impact on your waistline. This is a great high intensity low impact class that focuses on one of the biggest problem areas on the body for most Americans “belly fat”. The target areas include upper abs, mid section, lower abs/baby pouch, obliques, and lower back. This class is an upbeat energetic class with easy to follow revolutionizing core abdominal moves. All fitness moves taught in this class have modifications so participants of all fitness levels can participate in a safe effective manner. What you see is what you get, in Standing Hybrid Abs all core and lower back work is done while standing. This class doesn’t utilize any weights, medicine balls or ab mats because its taught standing up. This is the ideal low impact class with high energy and intensity. This unique class places no impact on joints but strictly attacks every plane of motion of the core and lower back. This class attacks the upper abs, lower abs/baby pouch, obliques, hip flexors, and lower back. Taking this class participants improve core strength, reducing belly fat, increase balance, and improves posture over time. Like every class we offer there are always modifications so participants of all fitness levels from beginners to advance can participate and get the maximum results out of this class. Resistance band body pump is a class that focuses on exactly what it’s called giving your body a pump. This Low Impact class uses resistance bands and body weight to tone the body. We tone up biceps, triceps, thighs, glutes, shoulder, back and core. The more we shape and tone the higher your metabolism goes up which burns more fat throughout your entire body for the remainder of the day!!!!! This is a high-energy low impact class because we use resistance bands in this class, which reduces the stress of free weights so this is ideal for someone who wants to shape and tone, but prefer not to use dumbbells or free weight. This class has modification and adjustments for all movements, which allows participants of all fitness levels to enjoy the maximum benefits and results. 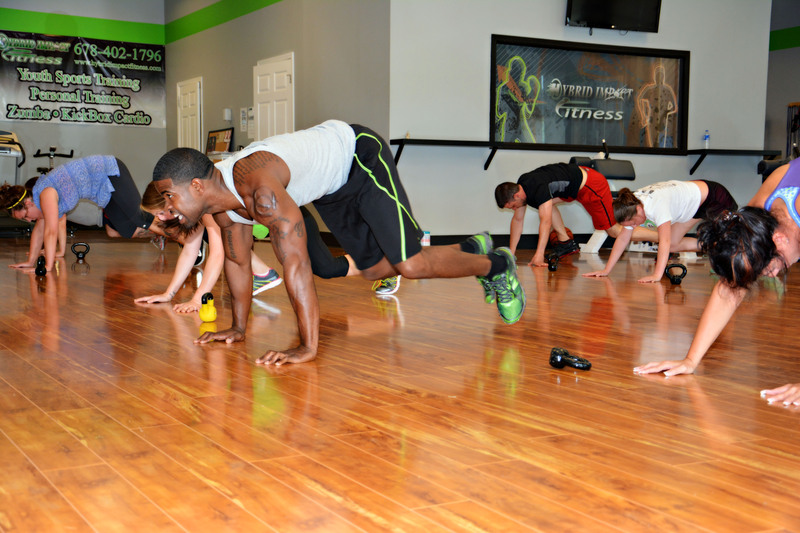 High Intensity Interval Training is our signature high impact class for the active to advanced participant. This class is up-tempo with energetic music using no props or equipment most of the time. We do exactly what the class is called H.I.I.T. intervals of high intense exercise followed by periods of rest or low intensity exercise. Calisthenics are the predominate form of exercises from burpees, mountain climbers, body squats, half burpees, planks, frog hops, squat jumps and much more. This popular class targets every portion of the body… literally. The amazing thing is everyone of the exercises have modification so even if a person is a beginner they can still join in and work at their own pace.